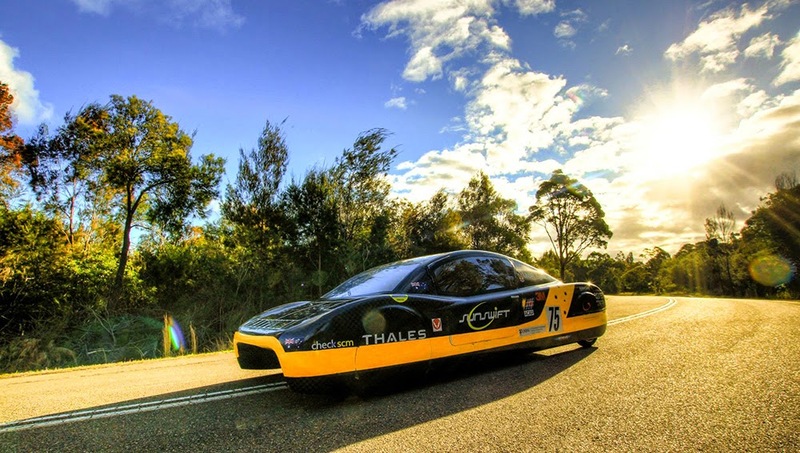 UNSW’s solar racing team Sunswift has launched a crowd-funding campaign to raise money to rebuild their car for Australian road registration. The eVe vehicle, which recently smashed a 26-year-old world record for the fastest electric car over 500 km, is seen as a symbol for a new era of sustainable driving. It is covered in zero-emission solar panels and uses a battery storage system that can be charged with the solar cells or by plugging the car into a power outlet. The world record proved the car is technically capable of covering the maximum distance a normal road user might want to drive in a single day. The next step in the Sunswift journey is to put eVe within reach of the average driver by converting it from concept car to road-registered coupe. The team of 60 undergraduate students behind Sunswift is aiming to raise $30,000 – about one-third of the amount they need – using the crowd-funding site Pozible. They plan to source the remaining money and components via sponsors and in-kind contributions from industry partners. If successful, it will mark the first time a university solar car team has built a vehicle to the stringent standards of the Australian Design Rules – the national motoring standards that govern vehicle safety, anti-theft and emissions. “Full registration is no humble feat with essentially the whole car needing to be deconstructed and rebuilt,” says project director and engineering student Hayden Smith. “The car requires front, rear and side impact protection, headlights, windscreen wipers, new raised suspension and new wheels in addition to updated electrical components. Coinciding with its latest fundraising push, the team has set an ambitious goal of achieving road registration as early as March 2015. “Having solar cars conquer the roads would mark a huge leap in the race to develop more sustainable transport alternatives, showcasing their potential to be commercialised in the near future,” Sunswift’s chief business officer and student Rob Ireland says. "However, we can't change the world by ourselves so we're asking for help to make it happen." Supporters who contribute to the crowd-funding campaign will be offered rewards including 3D printed models of the car, solar cell mantlepiece trophies and one-time advertising space during PR events. The campaign begins on Monday 1 December.